The young lady even has a sense of civic duty. Dry Creek residents share responsibilities of maintaining their airpark, and before Lauren came along the volunteers were all adults. Recently, however, she began to change that. “I’m on the Nominating Committee,” she says proudly with the cutest smile. “I go to all the airport meetings and when they asked for volunteers for the committee I raised my hand. At first all the adults laughed, but I just kept my hand up, and pretty soon they stopped laughing.” Lauren convinced them she was the one for the job, and now she is responsible for matching the right people with jobs to be done, such as taking care of that creek. Her knack for understanding others makes her perfect for that position. While not everything is perfect in Lauren’s world, her attitude sure is, as you’ll see next week. Until then, blue skies. Linda: The Dry Creek fly-in community prints a calendar every year featuring twelve of the airplanes that live on the field west of Houston. “We were doing the calendar photo flight,” says eleven-year old Lauren Jones, who lives with her family at Dry Creek, “when the photographer said over the radio, ‘You have a few bugs on the belly of that plane.’ But that was okay because we had just finished a Young Eagles Day, so we knew it would have bugs,” she says of her family’s Bonanza. The youngster’s enthusiasm for aviation and people is captivating. As aviators do, Lauren’s had adventures, and here in part two are more of them. “We like to visit Moody Gardens and one time we flew to Galveston and got a ride from the airport to Moody, but when we were ready to come back to the airport we couldn’t find a ride. A fancy charter bus came by and Dad asked if we could get a lift to the airport. The driver said, ‘Sure,’ and let us in because it was empty. As we were stepping off the bus Dad tipped him, and the driver said, ‘Thanks! Now I have to get going, there’s a bride and groom waiting on me!’” Lauren’s natural humor makes the story amusing, as she imagines a couple dressed in wedding attire, as she and her father unknowingly detour their ride. Math is the young aviatrix’s favorite subject in school (which probably makes Mom happy, as she was a high school math teacher), and she enjoys her teachers – especially Mrs. Strahan, Mrs. Russell, and Mr. Sesler. In referring to Mr. Sesler, her science teacher, she says “When you first see him you might not think he’s so fun, but when he gets in to class he is really nice and funny.” Lauren brings out the best in people. She seems completely at ease with older folks, as much as kids her own age. Mike: She’s even been to AirVenture in Oshkosh for the world’s largest convention, and says, “It was really busy flying into Oshkosh, but it was fun! With four airplanes landing in front of us, and three behind, you have to land and get out of the way.” She’s looking forward to going again this year. Don’t miss next week’s installment on this very special girl. Until then, blue skies. Linda:Lauren Jones is not your average eleven year old, and it’s not just because she was born on February 29 – “Leap Day.” This young lady’s passion for aviation may have been encouraged even before her first flight in her father’s Bonanza at the age of two weeks. Her dad, Stephen, was working out of town when his wife, Christine, went into labor, signaling an early arrival of little Lauren, their first child. 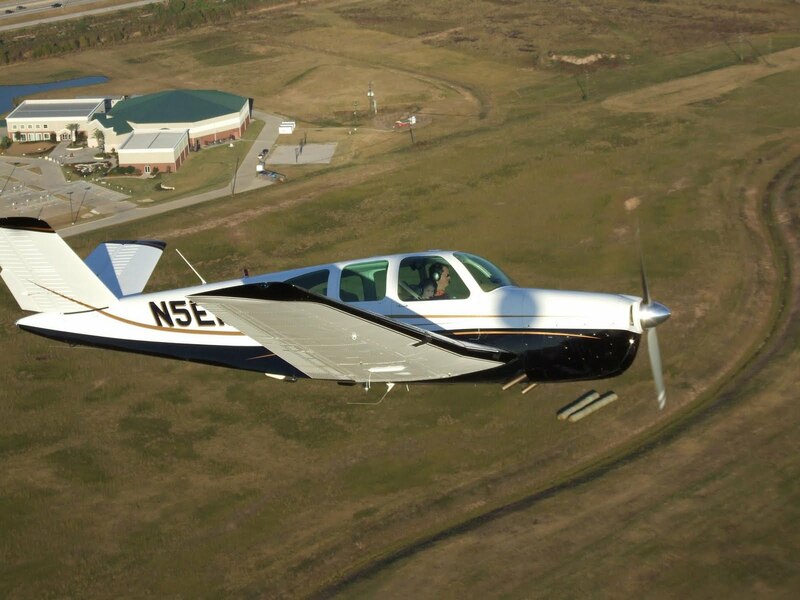 When Stephen got the call, he took off from Baton Rouge in his Bonanza, hurrying home to Dry Creek, a private residential airfield west of Houston. He hoped to arrive in time to take Christine to the hospital. His former flight instructor happened to be flying that morning, and was tuned in to the same radio frequency. When he heard Stephen, he said hello. 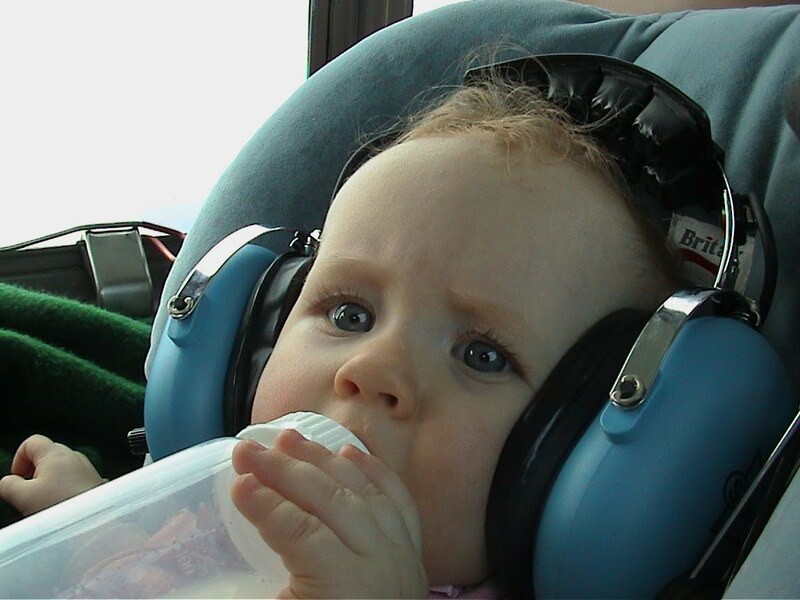 Surprised to hear his instructor’s voice after many years, Stephen instinctively said, “Mama’s having a baby!” Approaching the Houston area, Stephen was surprised as Air Traffic Control cleared him directly through the busy Bush Intercontinental airspace. Flying right over Bush, he realized that ATC had heard his mission. “It was a good thing, too,” explains Lauren, who has heard the story of her birth, “because I might not have made it if Daddy hadn’t come back in time. He took my mom to the hospital, and when I came out I wasn’t breathing.” The hospital staff got Lauren breathing and took her to Texas Children’s Hospital, where she checked out okay. 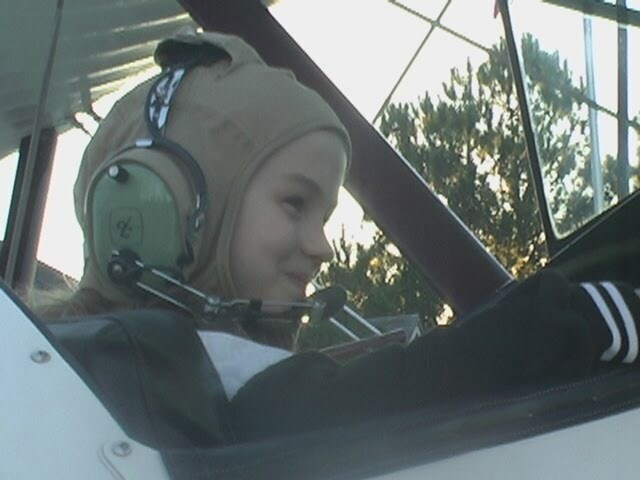 We first met Lauren at the end of the Valentine’s Treasure Hunt in Lufkin, She was still 10 then, but visiting with her in the restaurant on the field at the Angelina County Airport was more like conversing with an adult. Intelligent, articulate, enthusiastic, friendly, and compassionate toward others make Lauren an easy person to be around, and you kind of forget she’s so young. After the Treasure Hunt I asked her dad if we could write a bit about Lauren, and what follows in the next couple of weeks will amaze you, we promise. Mike: We had an opportunity to meet up with Lauren and her dad at the Young Eagles Day in Pearland. 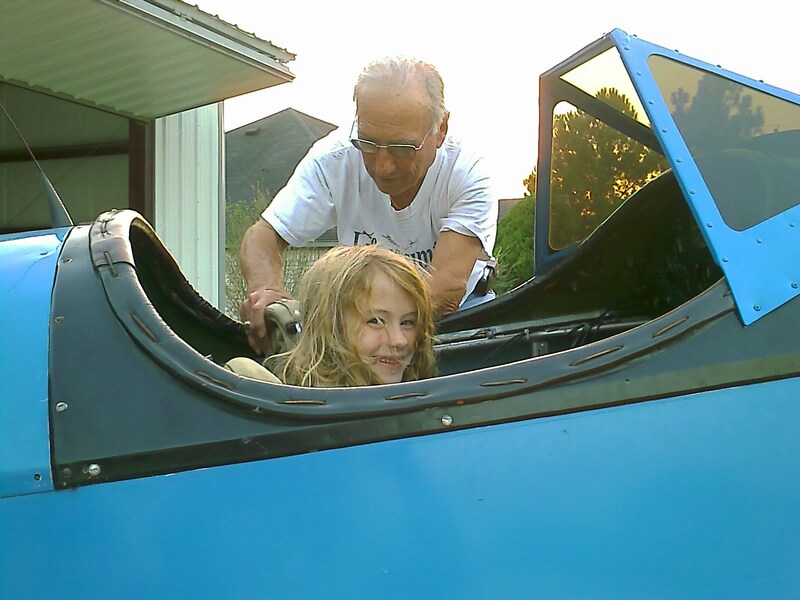 While Stephen was taking kids for rides in his Bonanza, Lauren helped with ground school, registration, socializing with visitors, and even squeezed in time for an interview. 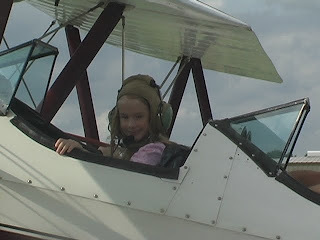 Perched in the hangar under the wing of a twin Bonanza, “T-Bone,” Lauren chatted with ease about her love of aviation. Linda: Lauren says, “There’s always something good happening” in aviation, and her attitude is infectious. You’ll get bit by that bug more next week. 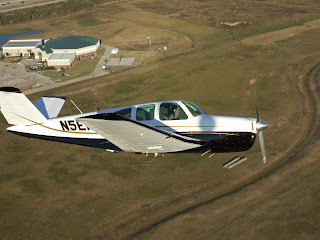 Mike: As we approach the downwind leg of the traffic pattern at Pearland Regional Airport, the two boys in the airplane with me harmoniously burst into singing “Eye of the Tiger” (Survivor, 1982). In the co-pilot seat was eleven-year-old Owen Merrell of Kenefick following me through on the controls, totally enthralled with his very first foray aloft. His friend, twelve-year-old Logan Stinnett of Hardin sat in the back seat, having experienced this feat once before. I gave him his first flight in a small plane a couple years ago here in Liberty. We were airborne nearly half an hour, Owen trying his hand at the controls of the airplane. He made machine-gun sounds as he swept and bobbed about the sky over the open green pastures south of Pearland and Alvin. Now we were returning to the airport to share the wonders of flight with another youngster. Linda: Young Eagles Day at Pearland was a huge success. 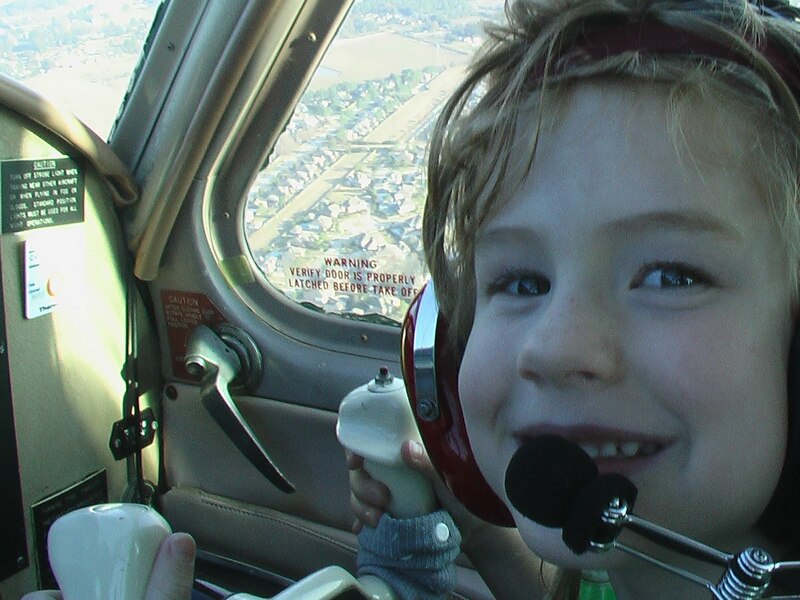 Ten volunteer pilots gave 26 kids airplane rides, many of them for the first time. Owen and Logan were the only two from Liberty County. A short classroom discussion of flight followed a pancake and sausage breakfast. After the first group of twelve kids finished the classroom briefing, Mark Davis arrived from Ellington in a Czechoslovakian-built L-29 jet trainer, making a few impressive low passes, then finally landing and taxiing the jet up to the hangar for the kids to see up close. Pilots escorted their excited passengers to an airplane, and showed them how to do a pre-flight inspection. The Young Eagles listened intently and asked smart questions, and soon were strapping in, donning headsets, and smiling for their parents’ photo op. The Lone Star Squadron formation flight team arrived from Conroe in their Van’s RVs (fast and sporty airplanes), making some beautiful high speed low passes in formation. They, too, eventually landed and parked along the flight line, joining in the Young Eagles flights before heading to the classroom to discuss plans for the upcoming May 18 Galveston Air Rally. Since our Cheetah is undergoing a major overhaul we didn’t have a plane for flying Young Eagles, but our friend Tim George flew his Cheetah in from LaPorte. We first met Tim a few years ago when he came to Flying Tigers to learn to fly. Mike was doing some part-time instructing there at the time and the two became fast friends. Lacking enough logged time to fly Young Eagles, he brought his airplane for us to fly and then helped with ground operations. Mike: In all, I had the pleasure of introducing or re-introducing five kids to the wonders of flight. I took Logan and Owen up one more time after taking another youngster up for his first flight. This time Logan occupied the coveted co-pilot seat and did a masterful job considering the length of time since he’d had his hands on those controls. Linda: I was eager to meet up with my young friend, Lauren Jones, too. While her dad flew Young Eagles in his Bonanza, Lauren helped with ground school, registration, socializing with visitors, and even squeezed in time for an interview. Perched in the hangar under the wing of a twin Bonanza named “T-Bone,” Lauren chatted with ease about her love of aviation. We’ll bring you her story in the coming weeks.